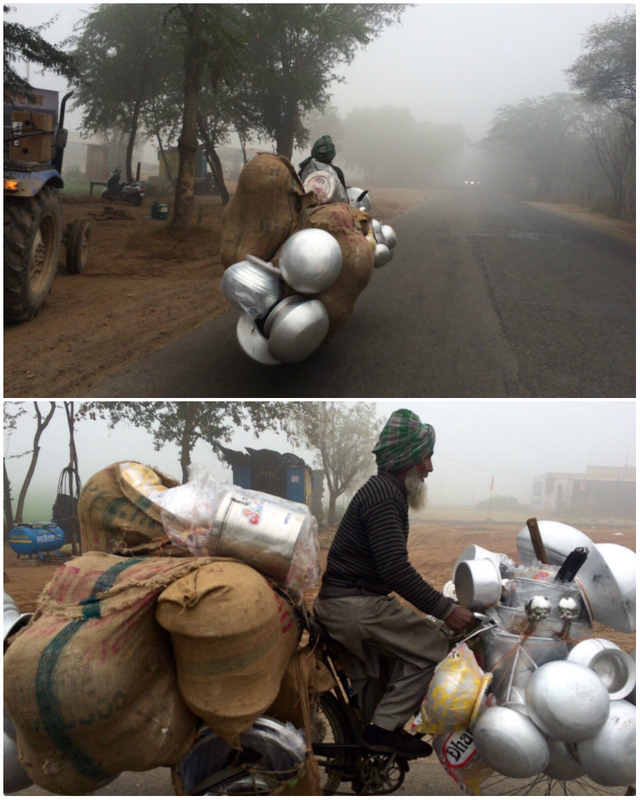 India is unique in so many levels. 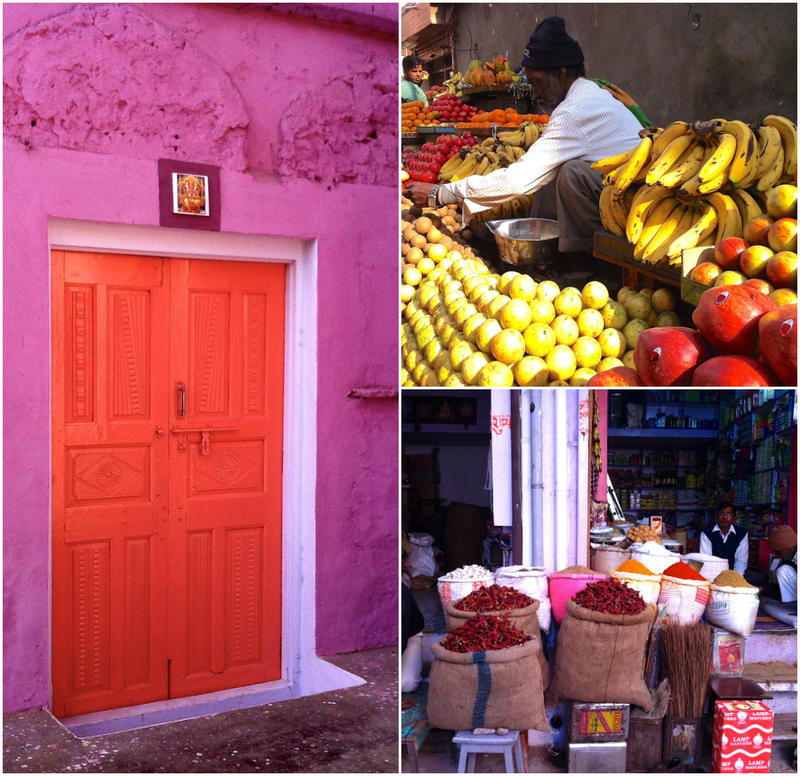 One of them is the liveliness and constant vibrance that grabs attention wherever one is. Colors, people, foods, smells, sounds, animals, buildings, all lure one’s gaze and awareness in all directions, that by the end of each day, I was dead tired. For good and bad. Not all images are jolly, not all scents are roses. 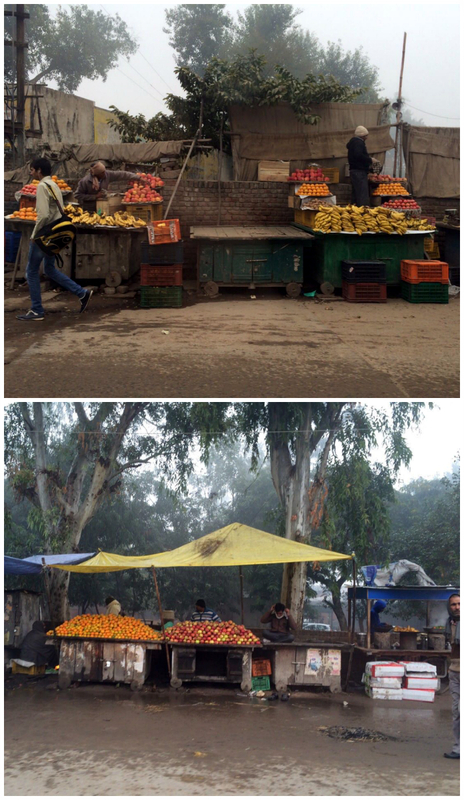 Yet, all those make India a photographer’s heaven, as wherever the eye blinks, it blinks a postcard. 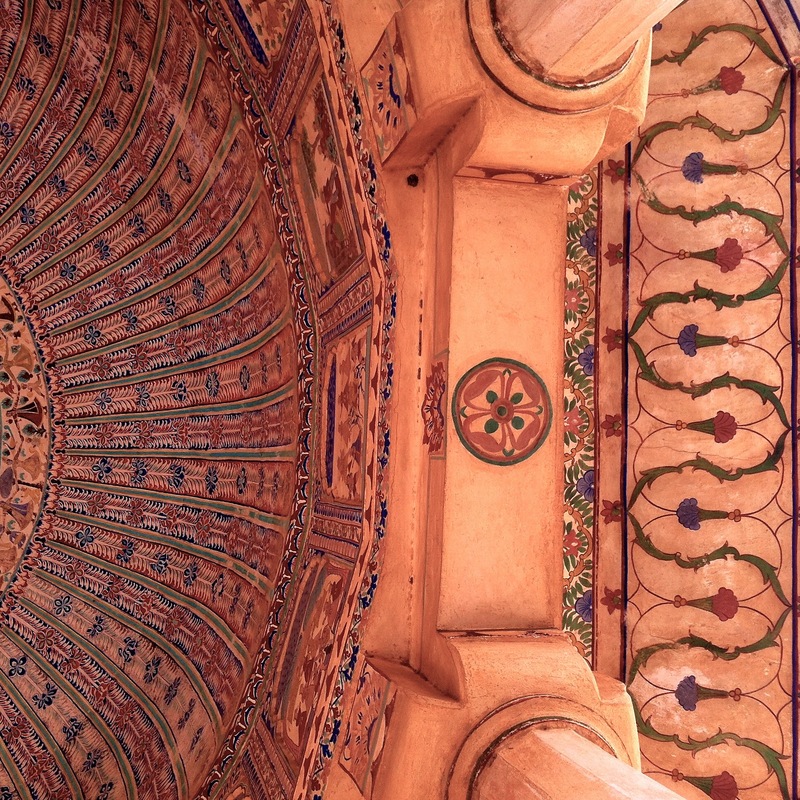 It was nice to take our time and walk around, sometimes sit and watch, and imagine, while listening to the audio tour in Jodhpur’s Maharaja’s palace. You can see how grand life was, back in the days, if you were the Maharaja, of course. 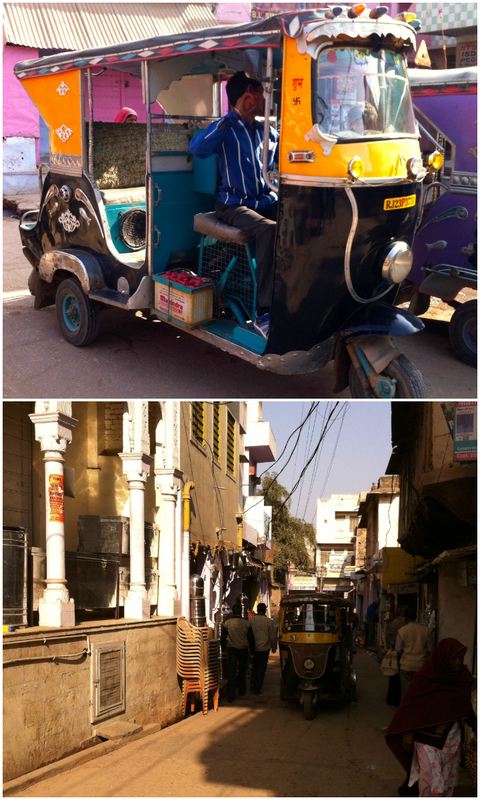 They don’t call Jodhpur “The Blue City” for nothin’. 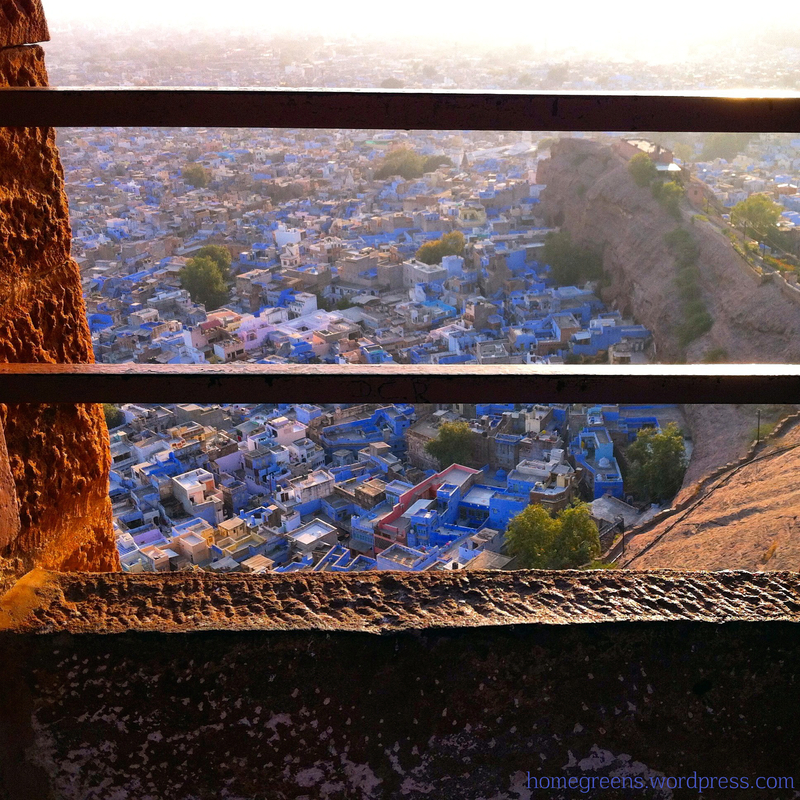 Indeed, it’s a spectacular view from Mehrangarh Fort, high above the city’s slopes. 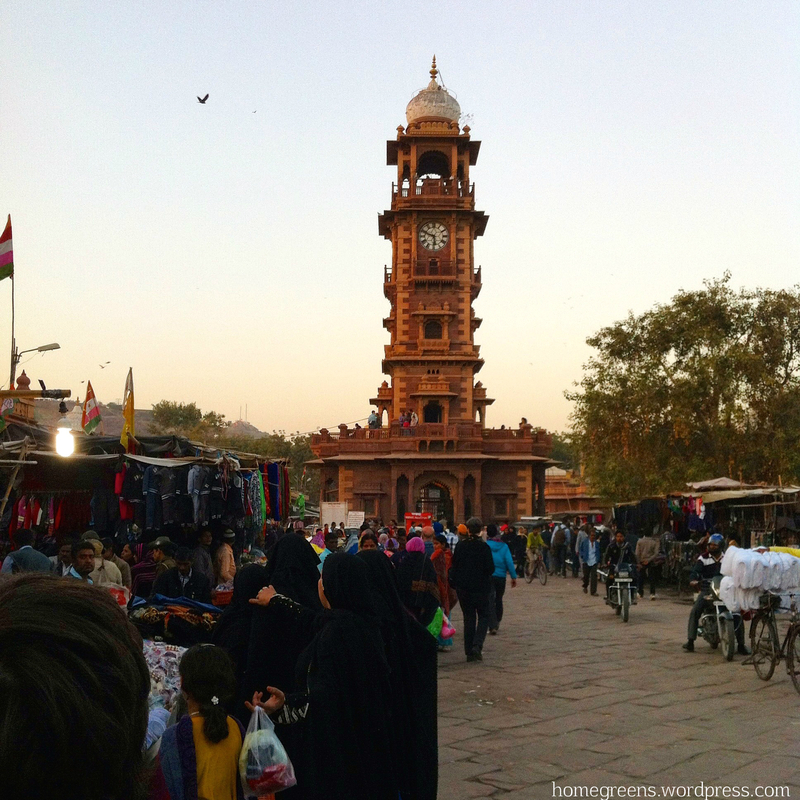 And, like any other city that prides itself, Jodhpur, too, can boast a busy, find-it-all market, with anything from saris, to spices and tea, with cows roaming between stalls, and sweet chai being offered for a few cents. 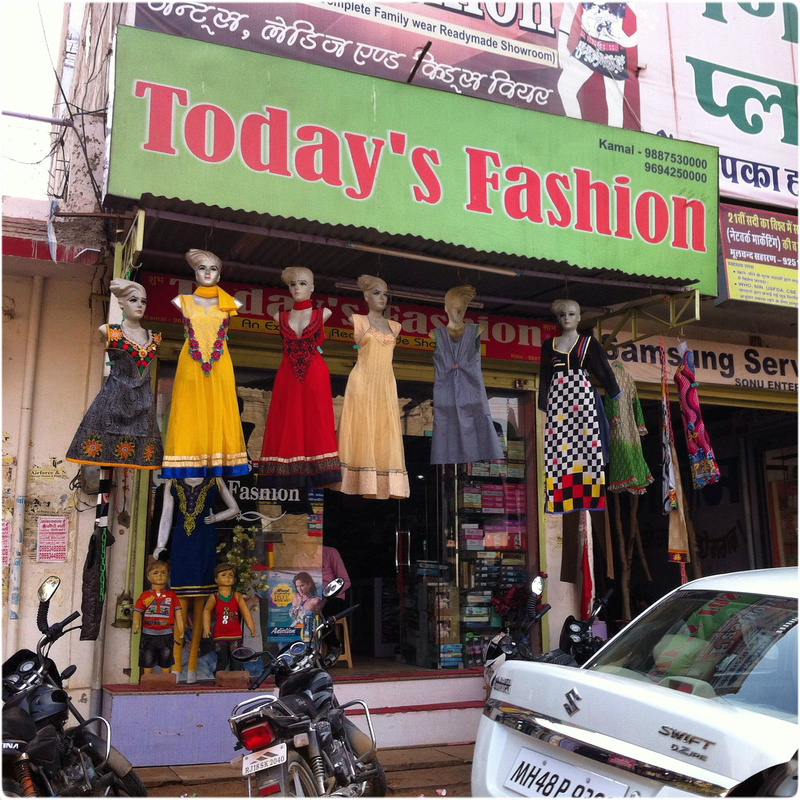 One- it was damn far from Jodhpur, in the middle of nowhere. We arrived so late at night after a few wrong turns and endless driving. What was I thinking? Two- what a quiet, tranquil place, located in a tiny cheerful village, where my kids interacted with the local kids, who hardly knew any English. 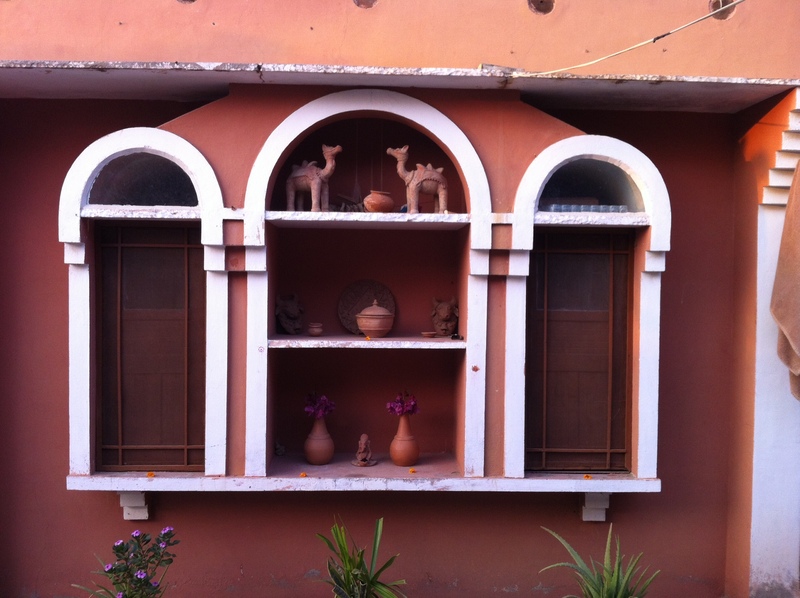 The haveli where we slept was old and charming. I guess I knew exactly what I wanted when ordering online. 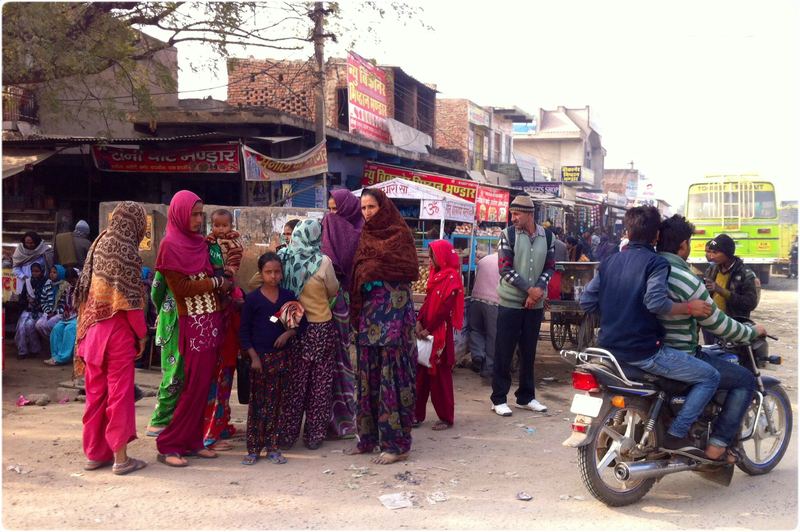 The best part: mingling with the locals, especially the kids, giggles and all. 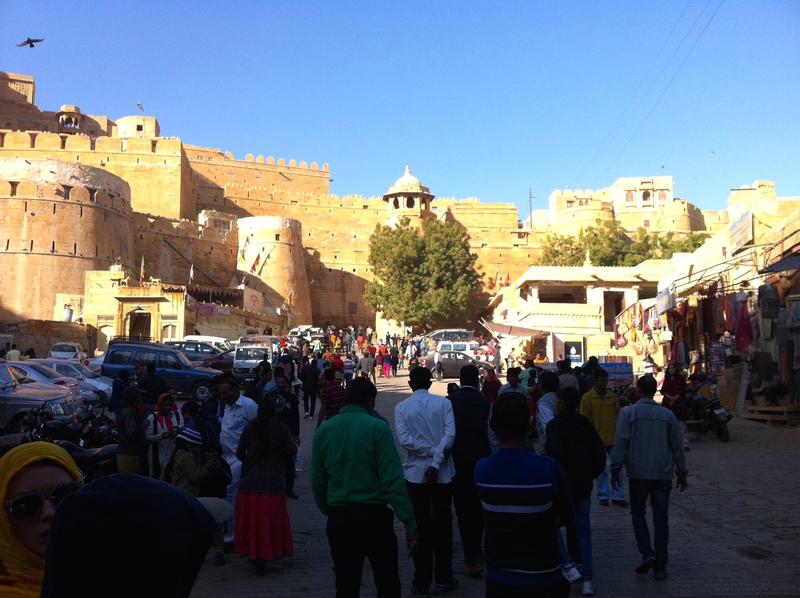 After many hours of driving through mustard colored, flat scenery of sands and villages, with the occasional Khejri tree and many more camels than cars, we arrived at the fort city of Jaisalmer. 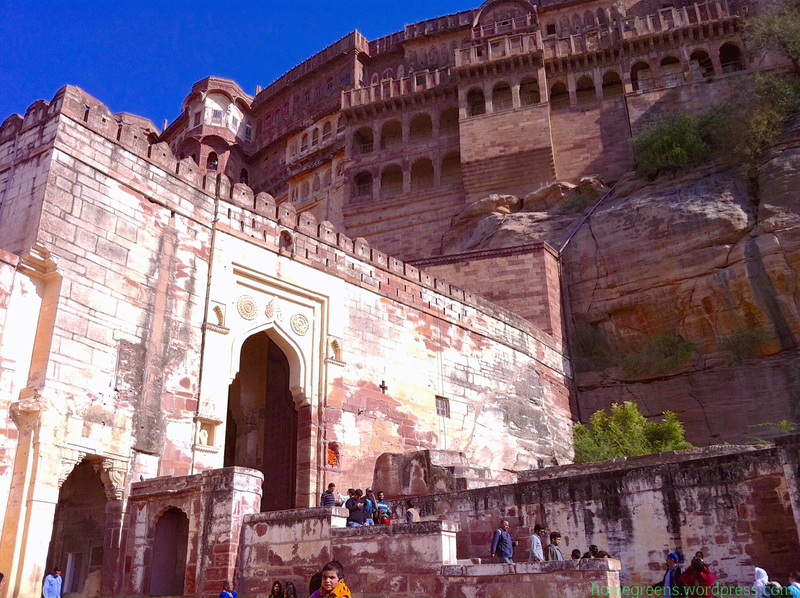 The city rises proud and high, elevated on top of a yellow sandstone hill, enclosed by old walls. 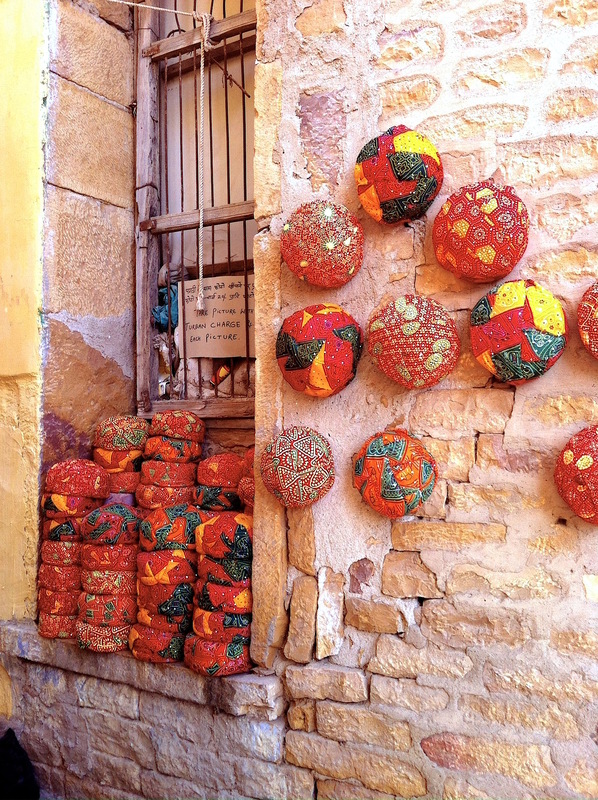 Lior: Jaisalmer reminds me a lot of Jerusalem- an ancient stone city, with markets, and warm weather. I really just loved walking through the old city, since it’s so easy to get lost. 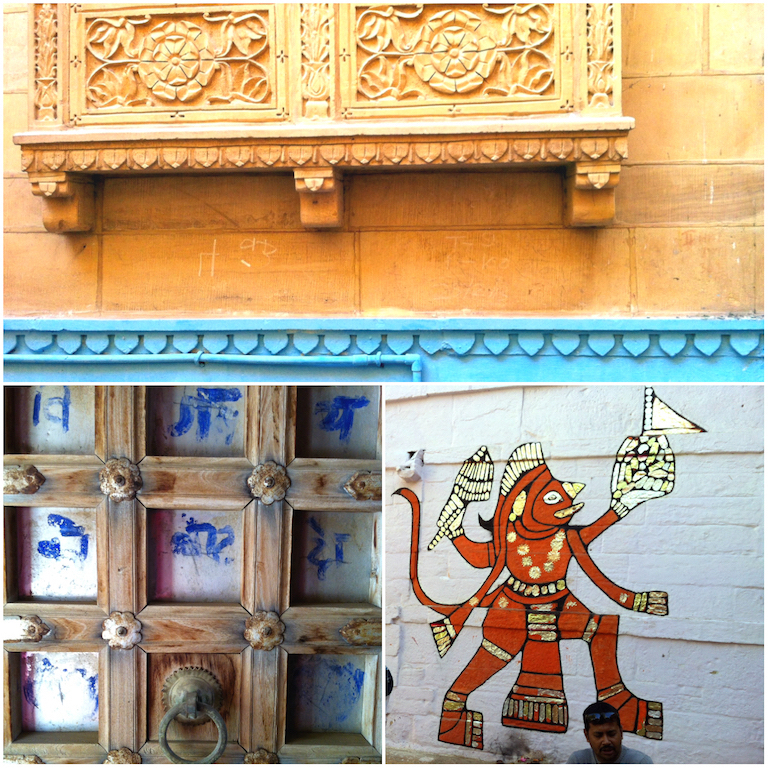 A stroll in the complex, winding, narrow streets within the old city, that contains many Jain temples and others, tiny stores, restaurants that lead to rooftops, people wearing colorful outfits, cows and camels, and most of all, beautiful stone carvings embedded in the buildings, made me feel like it’s all part of an Aladdin movie set. We took a local guide to show us around, which was OK, but I wish I had more time to just sit and view street scenes. Next time, perhaps. One of the best views we had, was from our hotel’s room window. We woke up early, just to watch and be in the moment of the sunrise at the desert horizon. 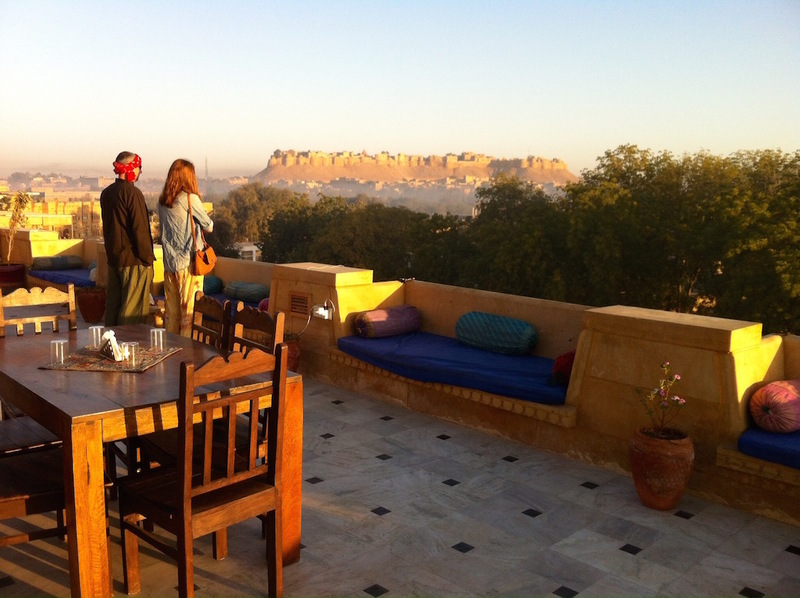 The Helsinki House sits on the very edge of Jaisalmer; beyond that is strictly desert for as far as the eye can see. 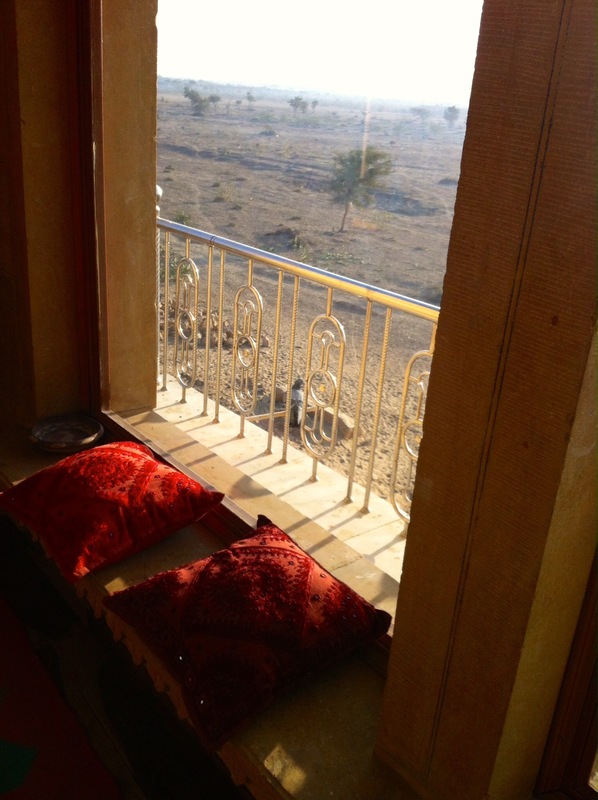 It was amazing to wake up, watch the sunrise, then walk into the desert, not knowing what we would see or find. 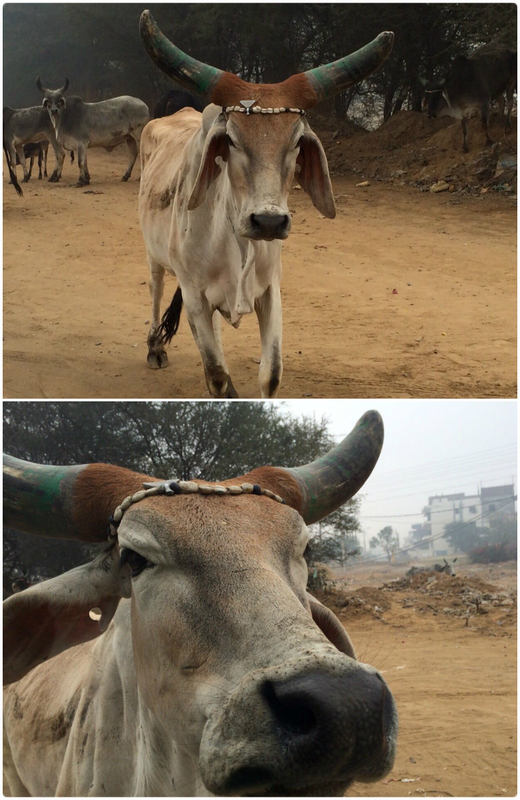 (We did end up seeing many stray dogs, an ox, and some sort of shrine). 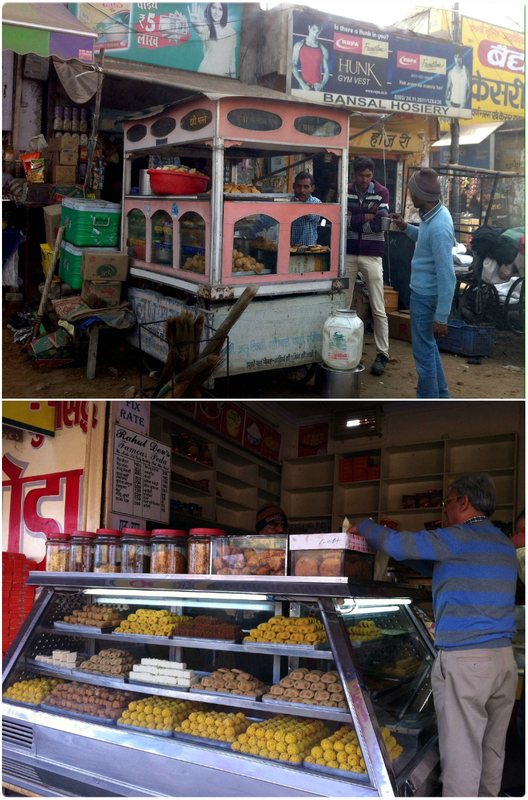 And after spending some “urban” time in Jaisalmer, we wanted to taste some solitude and desert life. So it wasn’t as empty as we wished for, but hey, we got a taste of the desert. 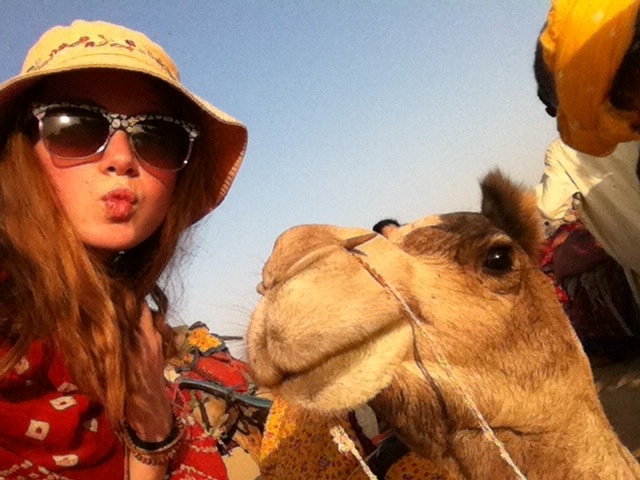 We slept in a tent, had a big party with food and dances, and sand. Our night in the desert tent camp was also fun. Although we came for solitude, of which there was none, we did enjoy a great feast and party in the camp. 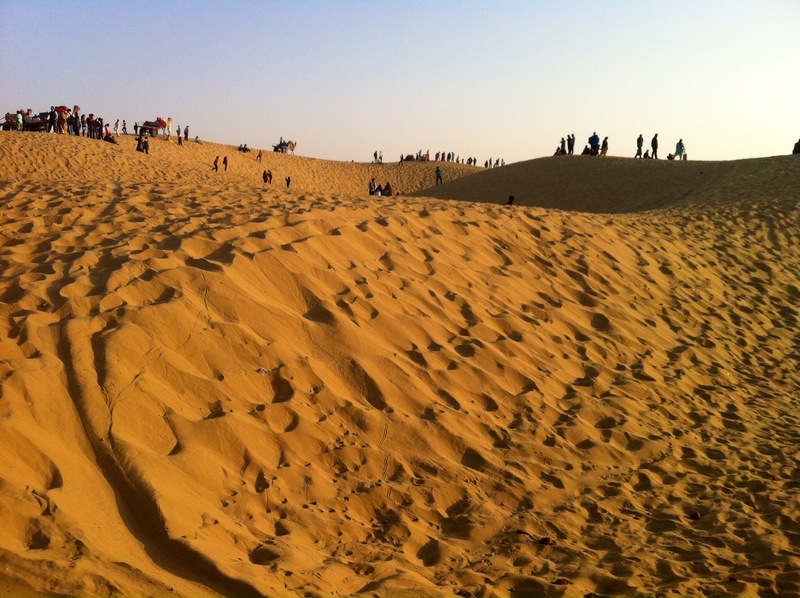 This ‘desert resort’ is apparently a popular venue for many Indian tourists! 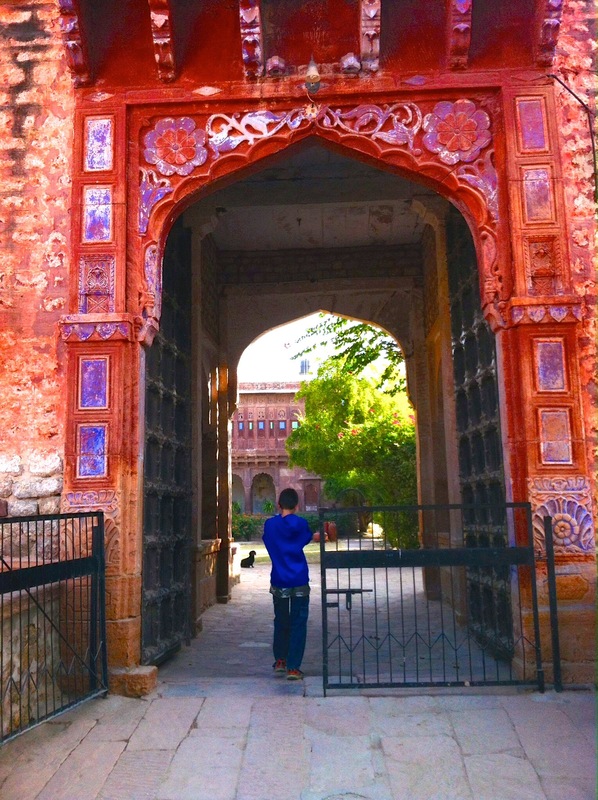 Nawalgarh is one of small villages located in the heart of Shekhawati, off the beaten path for most travelers to Rajasthan. 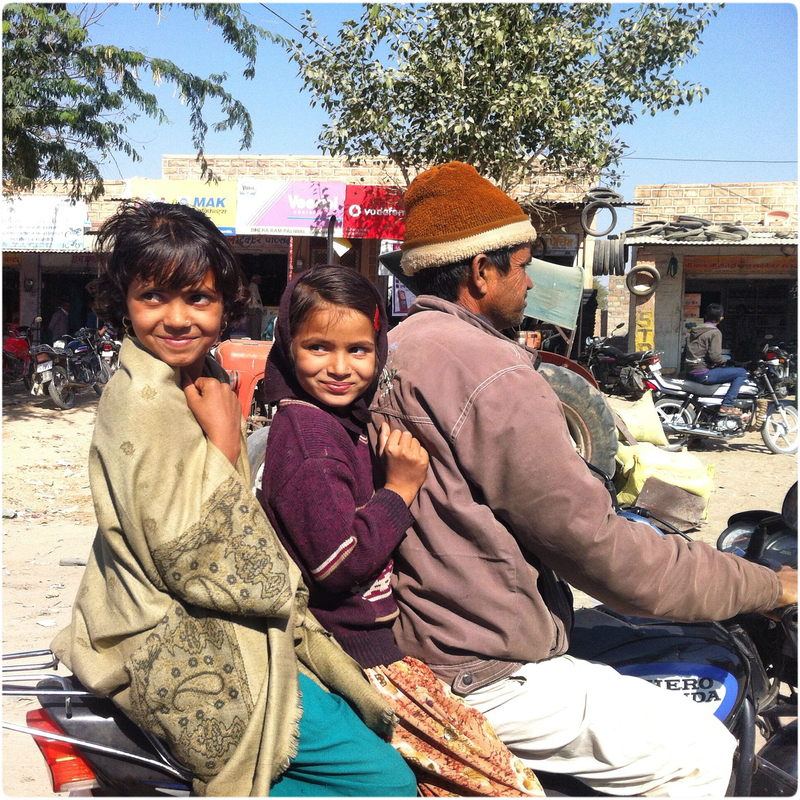 Visiting Nawalgarh gave us the chance to share some of the narrow lanes of the village with the rest of its inhabitants, aka, cows, sheep, motorcycles, tuk-tuks, and people, and feel the real, vibrant life of a village, right before tourism will change it forever. 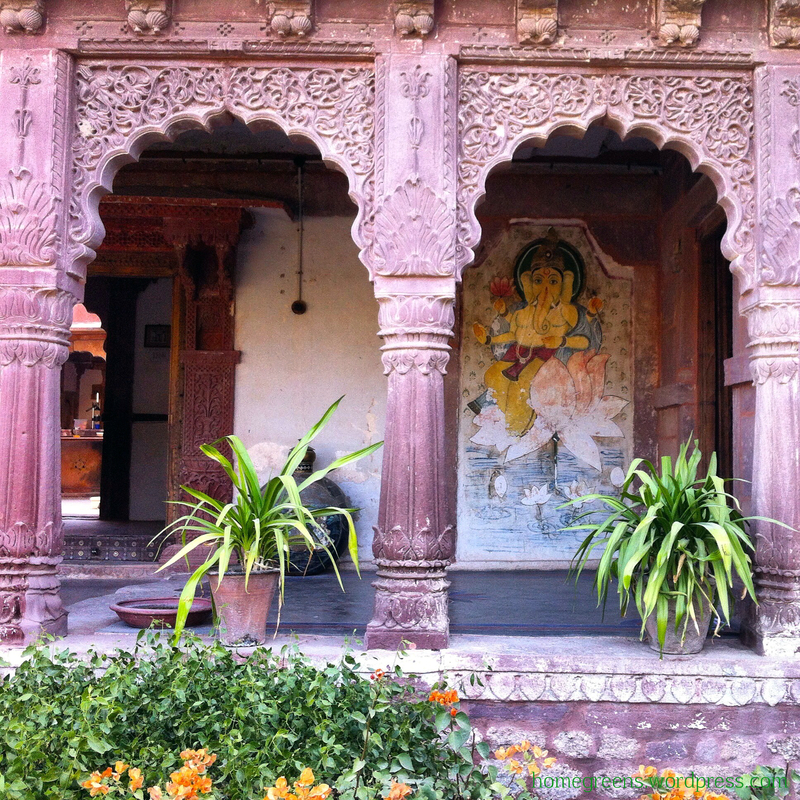 However, the bigger attraction of visiting this village, is the amazingly colorful old mansions, Havelis, usually built between 18th and 20th centuries, decorated with wondergul intricate, detailed frescos. 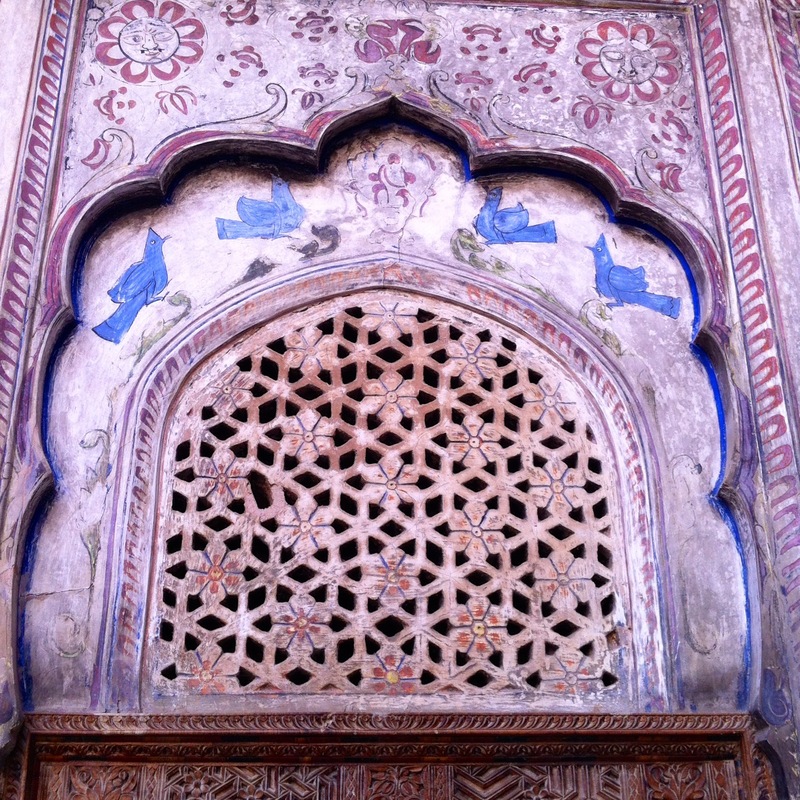 The more decorated, colorful the Haveli was, the more wealthy, and important the landlord was. 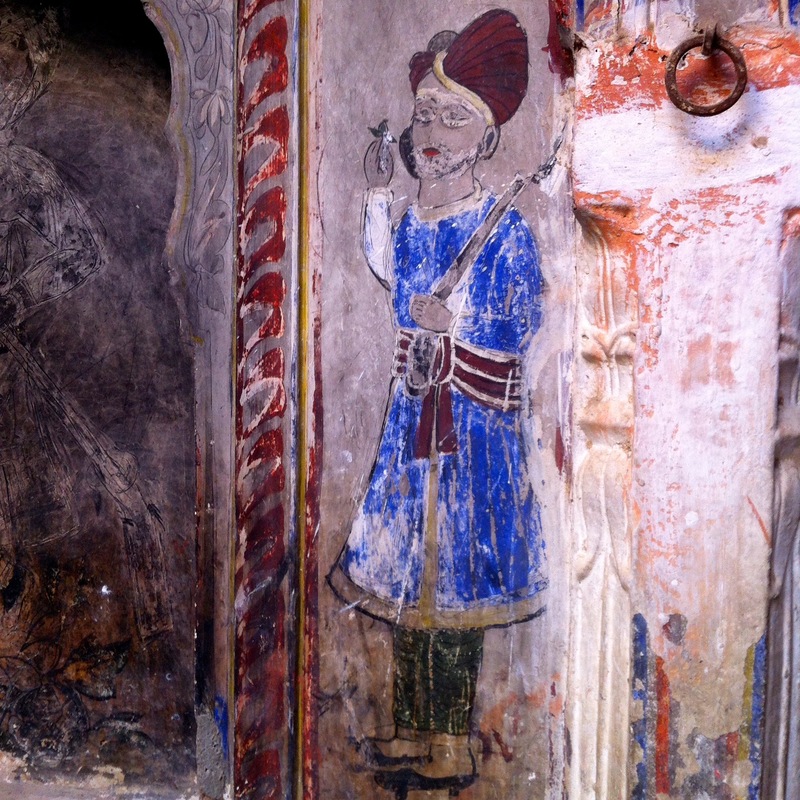 The murals depict anything from the Hindu mythical stories, to animals, scenes from the British colonization, to the (then) new inventions, like cars or trains. 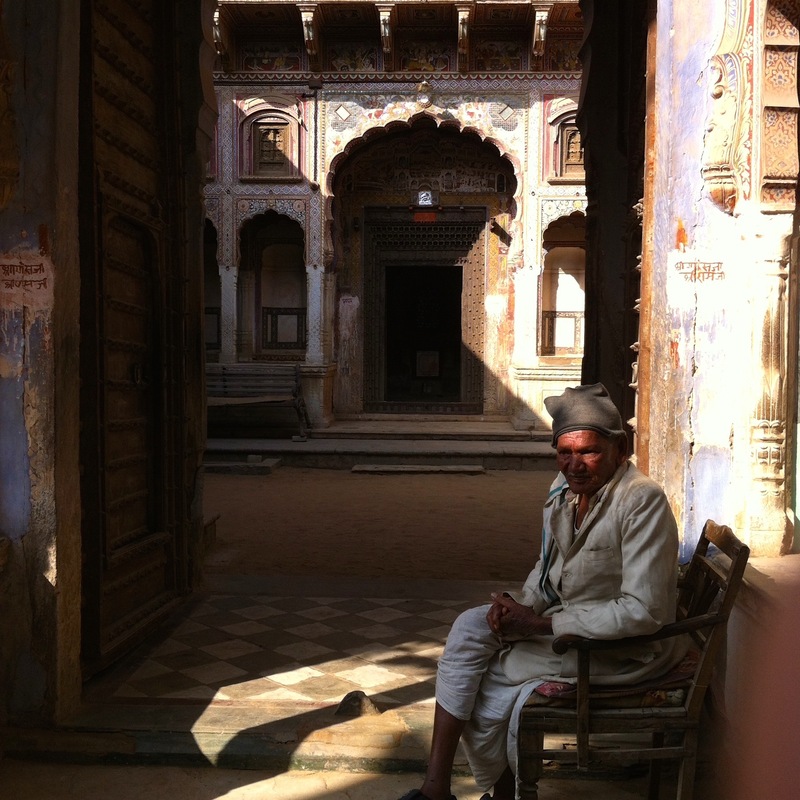 Most of the Havelis are empty nowadays or are maintained by a watchman (typically an old man), while some turned into museums. Some, sadly, are slowly deteriorating. 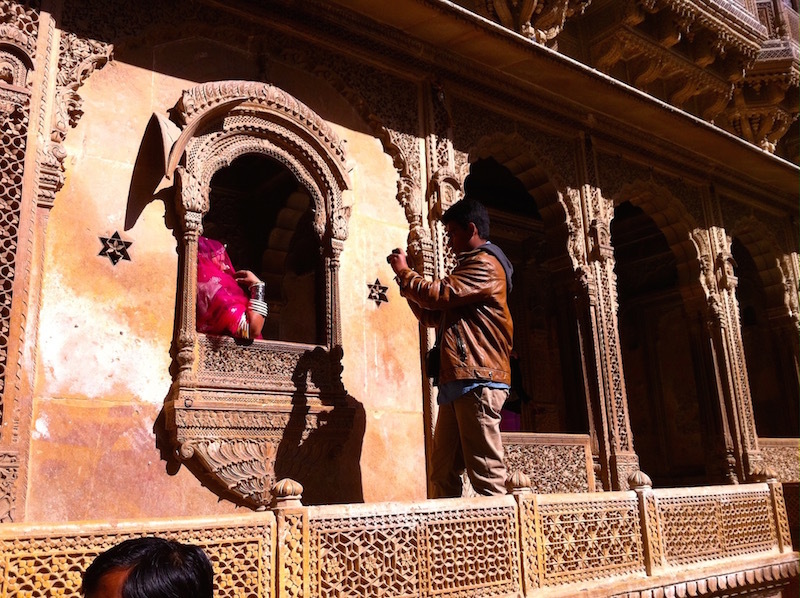 Lior: Nawalgarh was my first glimpse of the India my parents had told me about, from twenty years ago. 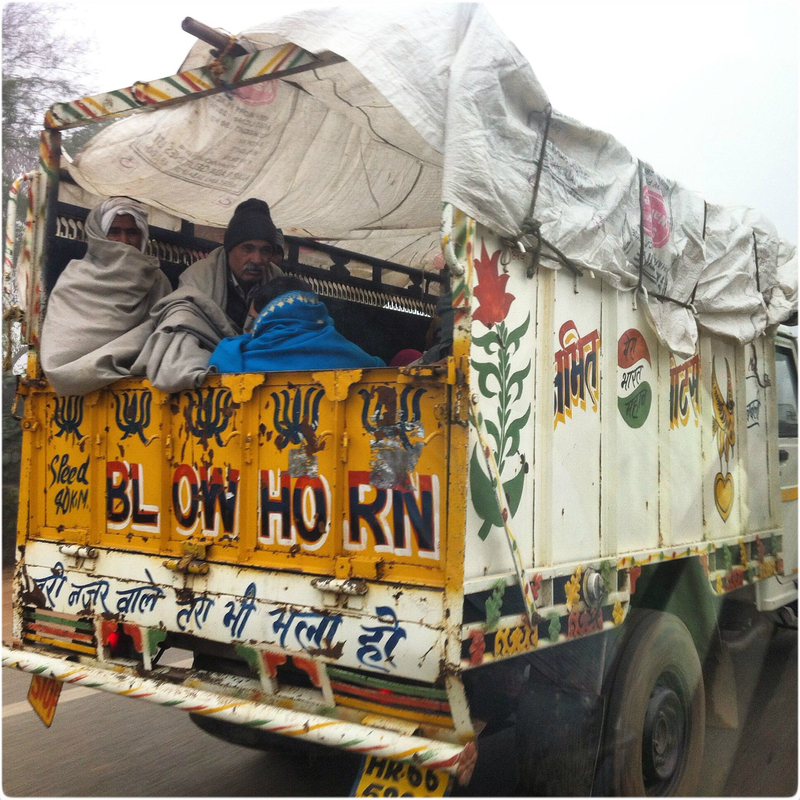 Everywhere we went, eyes followed; occasionally, a whistle followed too. 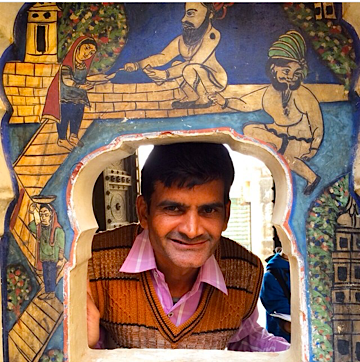 I learned the most about Indian history and culture here, thanks to Krishna, our guide for the day. We learned how merchants used to live, and how to identify a water well from afar. Usually learning about those kinds of things can be a little boring (mainly for kids), but I really enjoyed this because it was a ‘real life’ setting, as oppose to behind a piece of glass in a museum. 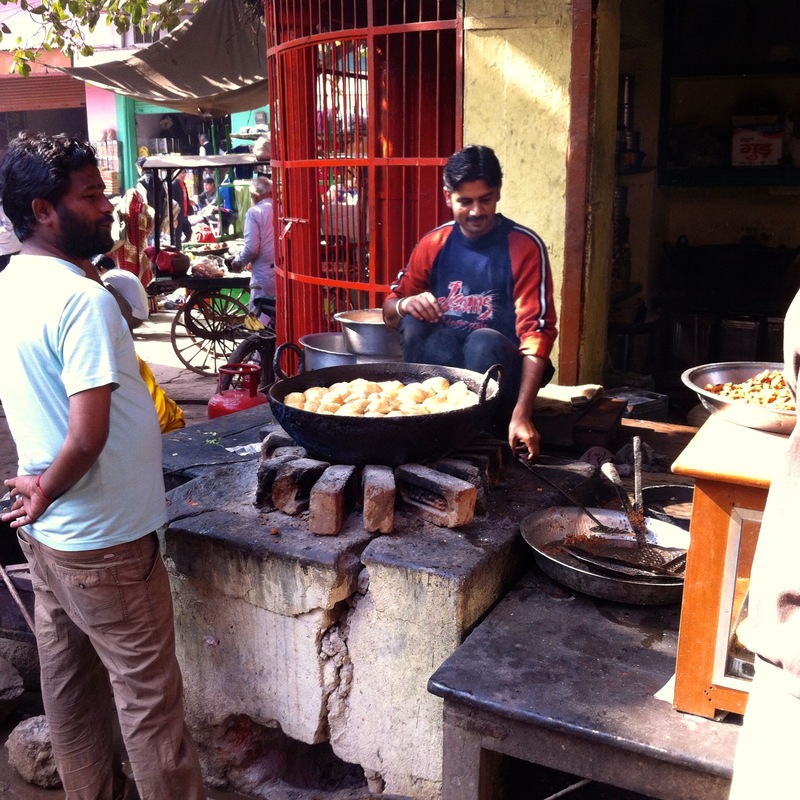 I would just like to point out that those samosas were hands down the best meal I had in India; they didn’t cater to our ‘American taste’, and gave it to us just like they would eat it. 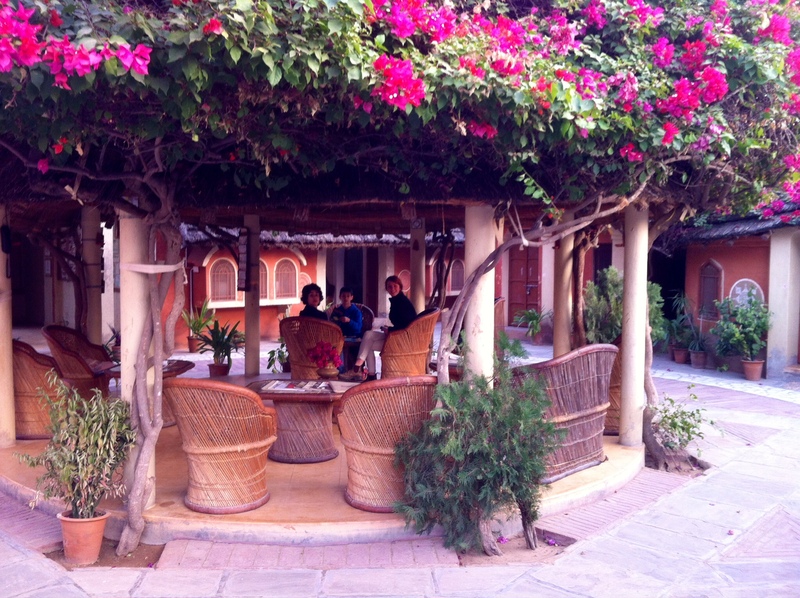 Our guesthouse in Nawalgarh was a little oasis after a long drive from Delhi. It also reminded us of our beloved Sinai. 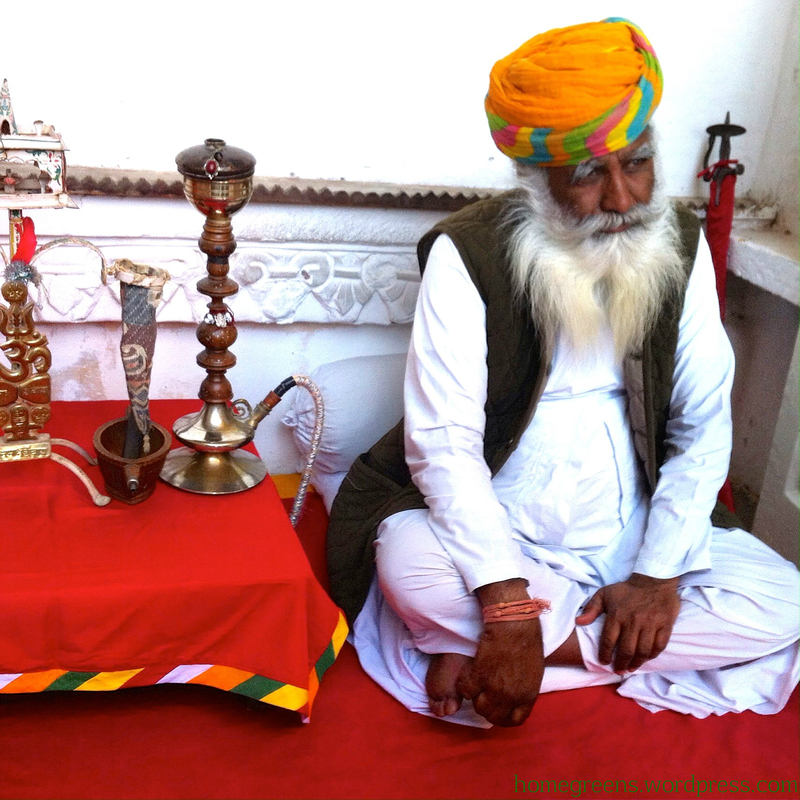 Apani Dahni provided a comfortable, homey sensation of relaxation. Our youngest immediately found a friend in this family farm, and they spent time flying kites, the all time popular activity in India. 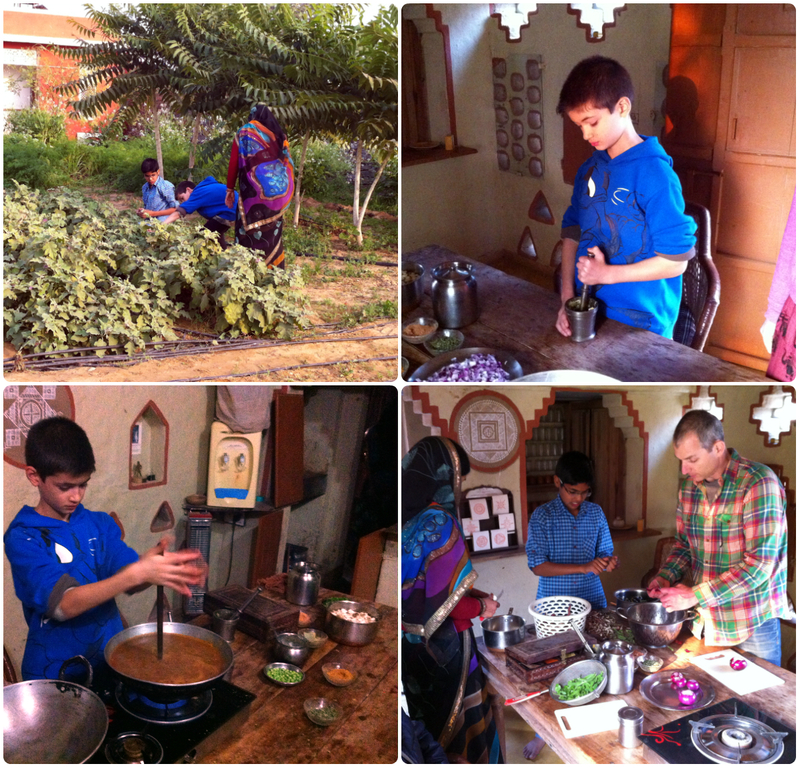 We also learned how to tie-dye scarves in a traditional way, as well as try and cook a traditional Rajasthani dinner, which we later shared with this nice french couple that blog. We want to go back there. We will. Oh, and thank you Krishna, for your superb explanations and answers to our endless questions. And here are the final scarves. Aren’t they pretty? After years of doing tie-dye experiments both at home and at camp over the summer, I finally learned the secret. 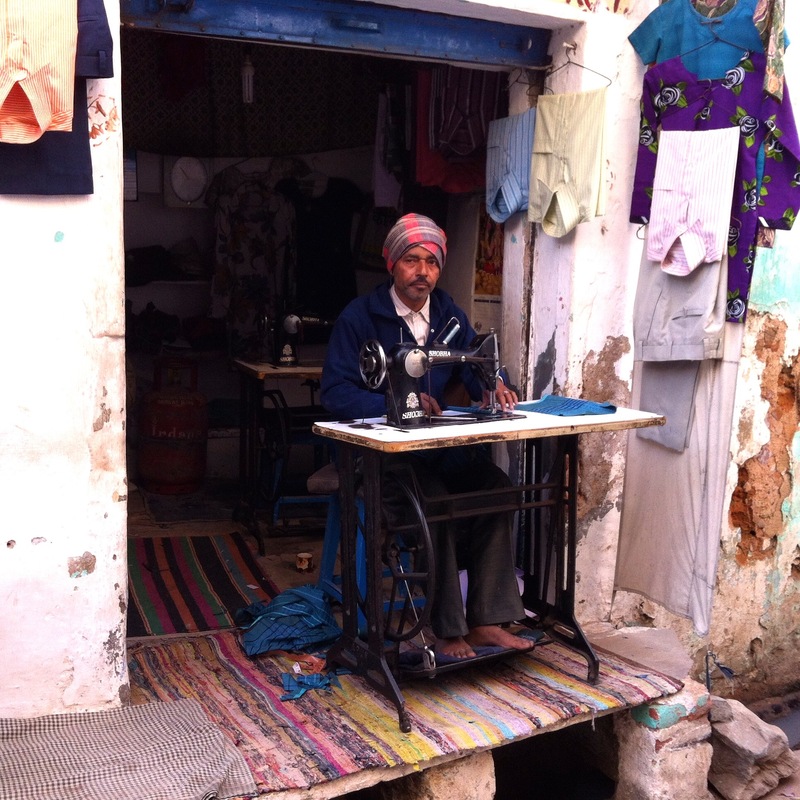 The traditional Indian tie-and-dye method works so so well, and our scarves look like they were made by a professional! I also joined the cooking class, and the food was delicious! Our main course was Masala stuffed Aubergine Eggplants, and we also received a cookbook to take home. Apani Dhani is like a small slice of heaven, I would strongly recommend it to anyone. 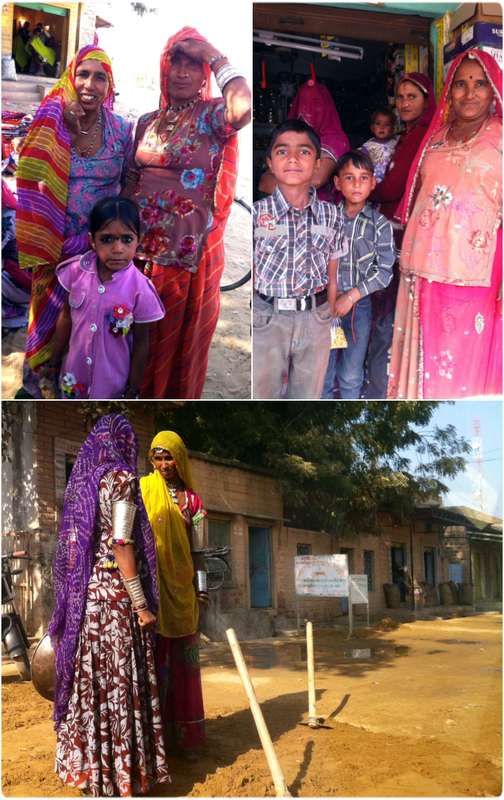 For us, going to India was like moving a thick velvet curtain, and climbing into a magical wardrobe that revealed a whole new planet. 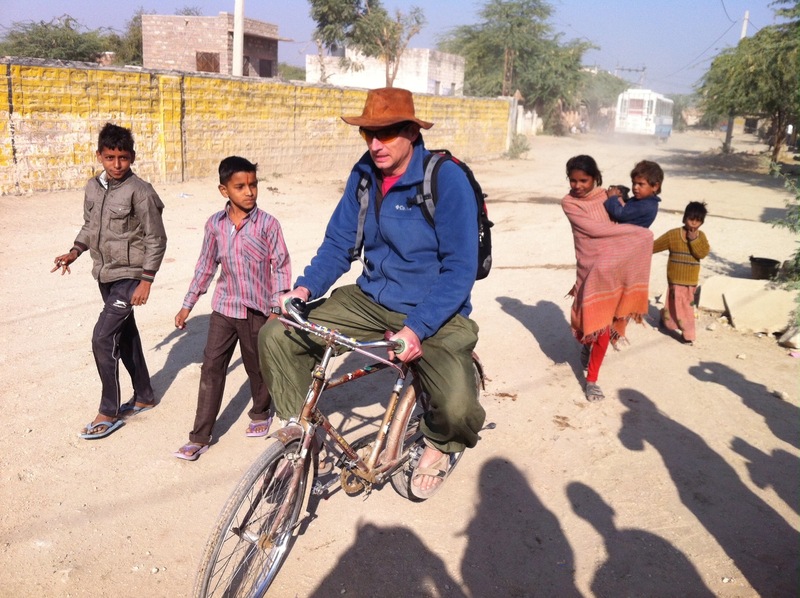 Though I visited India 20 years ago, visiting again with my children, exposed yet another dimension of this dusty, colorful, noisy, yet wonderful chaotic country. No wonder the Beatles were inspired by the psychedelic life in India. Here’s what my daughter has to say. 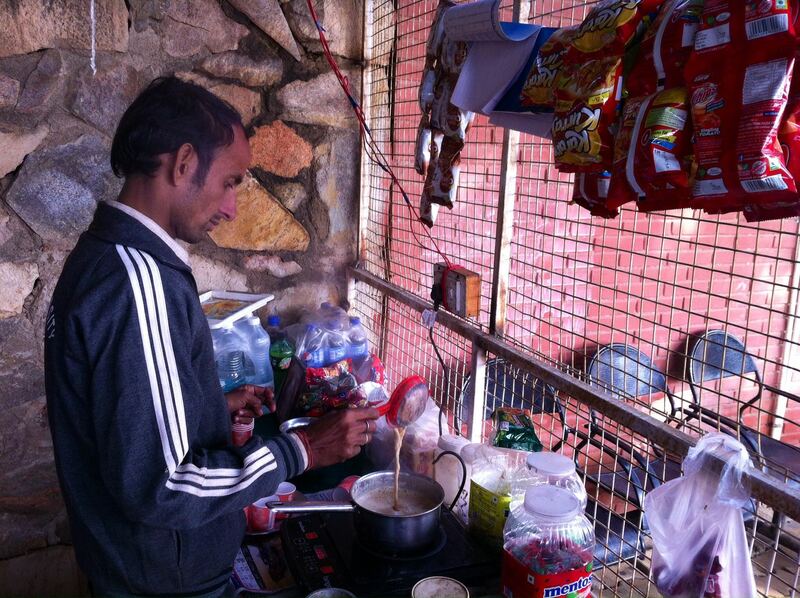 Lior: After being on the road in India, I know I can survive anything here in America. Our driver joked to us on the first day: “There are four things you need in order to get from place to place in India- a good driver, good horns, good brakes, and good luck.” Indeed, luck is what you need when there are cows and people crossing the road, driving in the opposite lane (to bypass) is a common occurrence, and when the fog settles, you can only see a few meters ahead. Once you leave the ingested city streets, though, you can relax and enjoy the sights, colors, and clear skies. 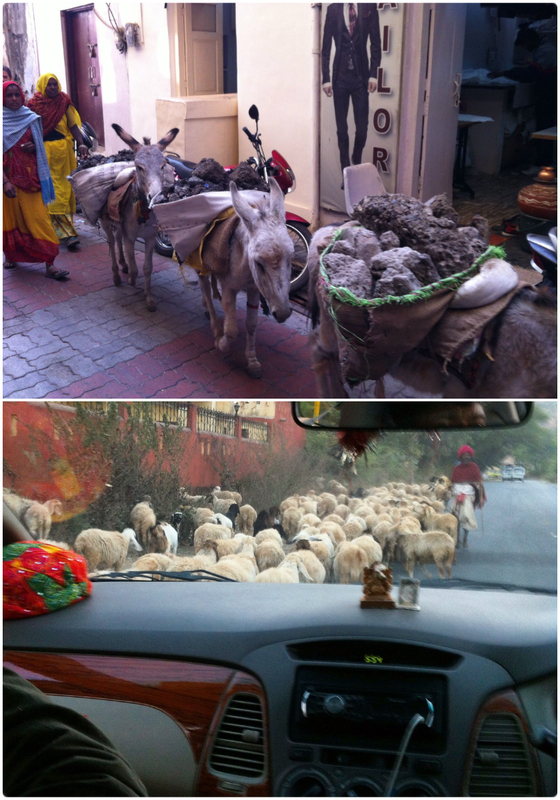 Crossing the road were donkeys, and sheep. 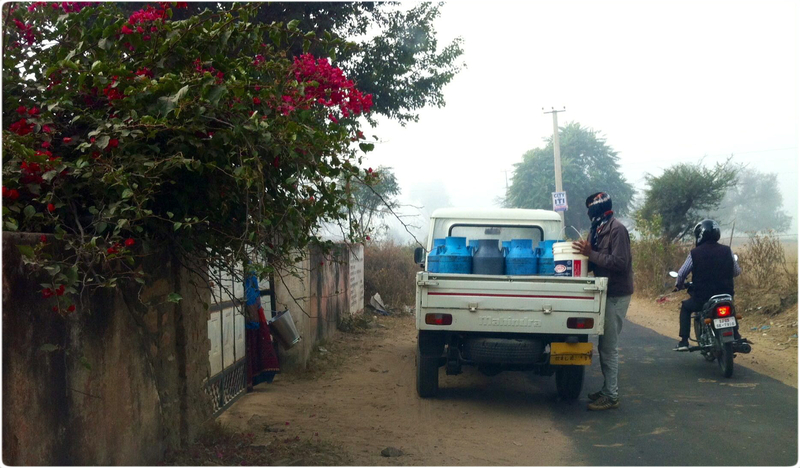 Not pictures: peacocks, dogs, camels, rickshaws, and what nots? I wish you could hear all the street noises. Lots of it.